The World Bank (2018) has created a very useful Atlas of Sustainable Development Goals that tracks global and individual country progress towards achieving the United Nations (UN) Sustainable Development Goals (SDGS). There are 17 goals that were first articulated in 2009 and cover a wide range of topics including reducing poverty, sustainable cities and communities, sustainable consumption, climate action, and more. The Atlas provides useful data, maps and graphs to help people understand which countries are making progress and why. Many people ask how the International Ecocity Standards relate to the SDGs. There are 18 standards that were first articulated in 2010 and cover a wide range of topics addressing ecologically healthy cities that are socially just places that enable people to flourish in balance with nature. 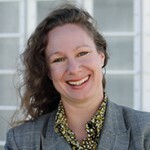 At the Ecocity World Summit held in Melbourne in 2017, the opening keynote speaker, Debra Roberts, observed that the Ecocity Standards have more to offer cities about how to achieve the SDGs than the SDGs themselves. This is probably because the SDGs address sustainability generally whereas the focus of the Ecocity Standards is on cities and their urban ecosystems. An urban ecosystem comprises the vast hinterlands distributed globally from whence cities draw energy and materials for provisioning, e.g. food for sustenance and resources for services, and to which they ultimately dispose wastes. The most obvious connection between the Ecocity Standards and the SDGs is through goal 11 that addresses sustainable cities and communities. However, there are other connections as well. Where the SDGs are stronger on social equity the Ecocity Standards are stronger on ecological integrity. Both are better together than apart and that is how they should work. The International Ecocity Standards are a heuristic to help us think about and understand what is needed to create socially just and ecologically healthy cities. Any framework or set of goals that advances these aims is part of the solution on the path to achieving sustainability outcomes. 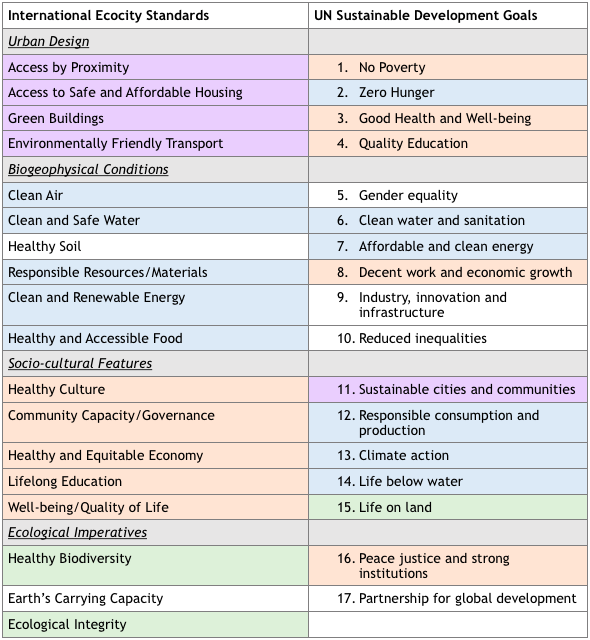 The following table (Table 1) presents a preliminary map of correlations between the Ecocity Standards and the SDGs. For example, both the Ecocity Standards and Sustainable Development Goals address bio-geophysical conditions associated with clean water, clean energy, and responsible use of materials for sustainable consumption and production. There are shared intents that are articulated differently, where emphasis is shifted. For example, the Ecocity Standard addressing Equitable Economy shares similar intent to the SDG for No Poverty, the Ecocity Standard addressing Access to Healthy and Nutritious Food is similar to the SDG for No Hunger, the Ecocity Standard for Ecological Integrity is similar to the SDGs for Life Below Water and Life on Land, and so on. There are probably more connections and I encourage you to explore further. Please share any insights you might gain, and if this topic interests you then I encourage you to engage with us at the upcoming Ecocity World Summit that will be held in Vancouver, October 7 to 11, 2019 (www.ecocity2019.com). World Bank. 2018. Atlas of Sustainable Development Goals. Online resource: http://datatopics.worldbank.org/sdgatlas/ (Accessed June 20, 2018). Ecocity Builders. 2018. International Ecocity Standards. Online resource: http://www.ecocitystandards.org/ (Accessed June 27, 2018). Ecocity World Summit 2017 (Melbourne). 2017. Online resource: www.ecocity2017.com (Accessed June 27, 2018. Ecocity World Summit 2019 (Vancouver). 2018. 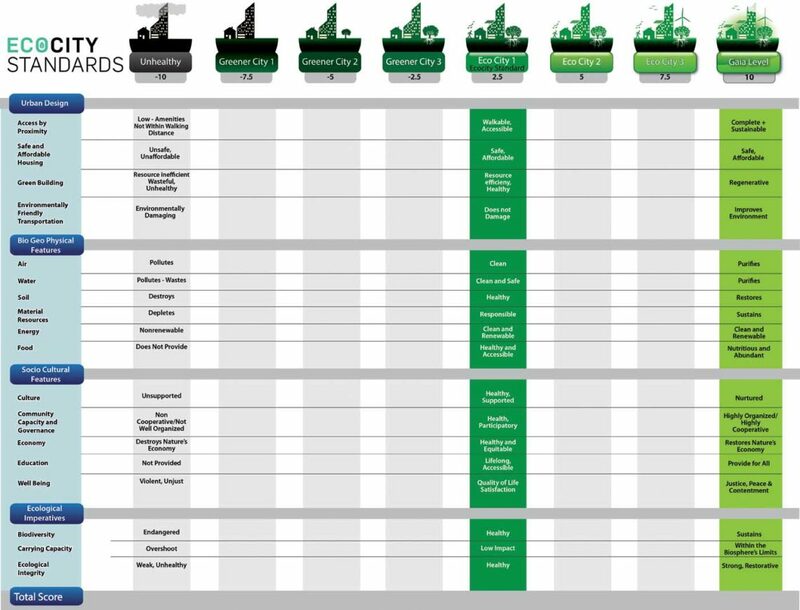 Online resource: www.ecocity2019.com (Accessed June 27, 2018.